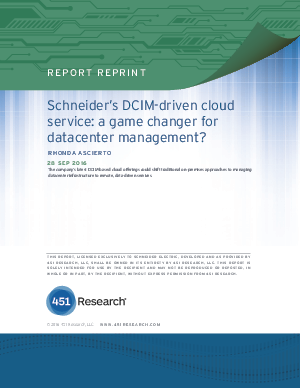 Schneider Electric is integrating datacenter infrastructure management (DCIM) software, big-data analytics and cloud services into the management of customers’ datacenters. Its recently launched StruxureOn cloud offering signals a new wave in datacenter operations, using a combination of machine learning, anomaly detection and event-stream playback to give operators real-time insights and alarming via their smartphones. More capabilities and features are planned, including predictive analysis and, eventually, automated action. Schneider’s long-term strategy is to build a partner ecosystem around StruxureOn, and provide digital services that span its traditional datacenter business.